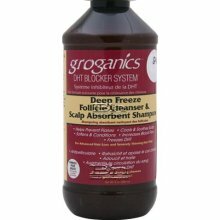 GROGANICS-DEEP FREEZE FOLLICLE CLEANSER & SCALP ABSORBENT SHAMPOO-Groganics DHT Blocker System Deep Freeze Follicle Cleanser & Scalp Absorbent Shampoo Helps Prevent Flakes Cools & Soothes Scalp Softens & Conditions Increases Blood Flow Freezes DHT For advanced Hair loss and severely thinning hairs Only! Deep Freeze Follicale Cleanser & Scalp Absorbent Shampoo Directions: Wet Hair thoroughly. Apply a generous amount of deep freeze follicle cleanser & Scalp Absorbent Shampoo and massage into scalp. Leave in for 5-10 minutes. Rinse thoroughly. Use Deep Freeze Scalp Stimulatnt Conditioner.